The new aquaponics system that Global Gardens volunteers operate is located at Union Middle School. It was constructed by Talihina, Oklahoma Symbiotic Aquaponic and bolstered by a $5,000 grant from the Grainger Foundation. Now that it’s operational, students and members of the community will maintain the system and take care of its fish and plants, says Symon Hajjar, Global Gardens’ middle school educator. Heading up this effort is volunteer Prentice Shew, who has had to learn quite a bit about aquaponics in a very short time. Prior to its construction, Shew visited Symbiotic Aquaponic to see firsthand how such systems work and take a one-day class on the basics of aquaponics. 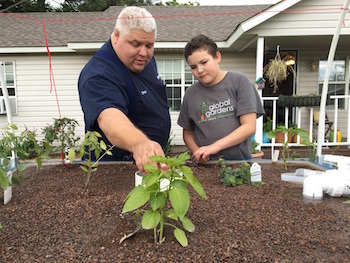 Even though he’s still learning, Shew shares his newfound aquaponics knowledge with students and other volunteers. “That’s my baby,” says Shew of the aquaponics system. He teaches classes to students and adults about the system. Shew explains that koi were used to kickstart the farm, which features a 250-gallon tank, and tilapia were added later. Beans were the first seeds to grow roots, and he was amazed at their quick growth. “In two weeks they were four inches tall and had six-inch roots,” he says. In a short time, the aquaponics operation has blossomed to include oregano, basil, tomatoes, bell peppers, poblano peppers, flowers and more. Shew is pleased with progress so far and is excited about what the future might hold. Another benefit of the project, says Shew, is that it increases awareness of the potential for aquaponic farming in Oklahoma. To his knowledge, Tulsa only has one other similar operation—Scissortail Farms, which grows its produce via aeroponics. In addition to the aquaponic system at Union Middle School, Global Gardens operates school gardening education programs at Eugene Field Elementary, Rosa Parks Elementary and McAuliffe Elementary. Both in-school and after-school offerings are available. All four schools that Global Gardens works with fall under Title 1 classification (significant number of low-income students), says Hajjar. Each community garden exposes students to something they might not otherwise be familiar with—food production. Once they start, they’re often hooked.